ServiceMaster by Wright received a call last Monday, May 21, 2012, at 4:00pm from a condo owner in Naples, Florida, for water damage. 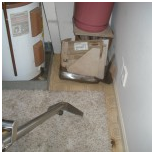 The water damage was caused by the hot water tank line in the utility room. It affected the utility room, bathroom, closet, hallway, living room, master bathroom, and foyer. ServiceMaster extracted the water from the condo and then started the structural drying. ServiceMaster removed and disposed all the wet carpet padding and toe kicks. The vanity and vinyl flooring had to be removed due to the water damage. The technicians applied antimicrobial solution to avoid mold growth. The technicians set up dehumidifiers and air movers thru out the condo to assist in the drying process. In the utility room the base was removed. The drywall and insulation below the base was removed to help with the drying out of the structure. ServiceMaster’s construction department worked with the condo owner to rebuild the damaged areas. In the utility room they were replacing the drywall and painting to get it back to where it was before the water damage occurred. All rooms had the walls and base repainted as part of the repairs. The vanity and vinyl floors will be replaced. Also, replaced the carpet padding and reinstalled the carpet. ServiceMaster’s carpet department will then clean and deodorize all the affected carpeting. We are committed to provide quality water extraction services to Southwest Florida, Collier, Lee, Manatee and Sarasota Counties businesses. Call 866-676-7761 today!